SOME SAID it was the disruption of some flights to LaGuardia airport early on January 25th that persuaded him. The air-traffic controllers at Donald Trump’s local airport—unpaid after 35 days of the government shutdown—had voted with their feet. Yet the great climb-down the president affected later in the day had in reality been on the cards for some time. He shut down the government last year in a bid to strong-arm the Democrats to fund his promised southern border-wall. Yet they flat refused, which was also predictable. Most Americans don’t want the wall, especially on the left. And the president had helpfully made it clear that the mounting socio-economic damage caused by the shutdown was on him. Naturally, most Americans—including some of Mr Trump’s loyal supporters—therefore blamed him for it. Mr Trump’s ratings have fallen to their lowest level in a year. The latest poll suggest only 37% approve of his performance—a shockingly low number at a time of near full employment. In an address from the Rose Garden, Mr Trump announced the terms of his surrender. He said he would sign a bill to fund the government for three weeks, including back-pay for some 800,000 affected government workers. In that time, he expects both parties in Congress to agree additional border security measures. 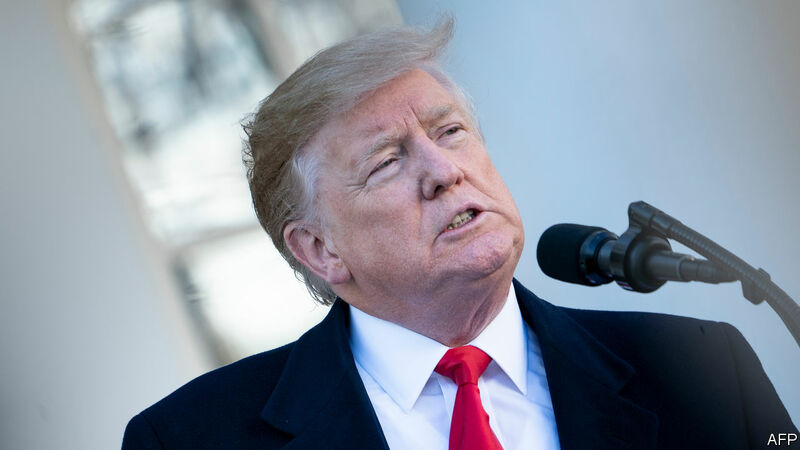 If they fail to do so, or if what they agree does not satisfy his demands, Mr Trump said he would either shut down the government again, or else invoke emergency powers to get his way. His effort to save face, in the process of announcing a retreat of Napoleonic dimensions, was almost heroic. “After 36 days of spirited debate and dialogue, I have seen and heard from enough Democrats and Republicans that they are willing to put partisanship aside,” he said. “They have said they are for complete border security, and they have finally and fully acknowledged that having barriers, fencing, or walls—or whatever you want to call it—will be an important part of the solution.” Oh, yeah? The Democrats, emboldened by their takeover of the House of Representatives, conceded nothing during the stand-off. They refused to engage in any serious negotiation until the government was reopened. Mr Trump’s effort to use the livelihoods of government workers as leverage was mere “hostage-taking”, they repeated—all on-message for once—like a mantra. Yet they also suggested that Mr Trump will not get his way once the government reopens. Last year the Democratic leader in the Senate, Chuck Schumer, offered Mr Trump $25bn to build his wall in exchange for a pathway to citizenship for the 700,000 long-stay illegal immigrants (known as “Dreamers”) he had threatened with deportation. That deal looked at the time like the best Mr Trump could possibly have hoped for. Yet he turned it down on the advice of his in-house immigration hawks. And it does not appear to be available now. Nancy Pelosi, the Democratic House Speaker, has called the wall an “immorality”. That sounded as if he might be grateful for even a little border-wall from the Democrats, but they are in no mood to give him any. As things stand, they will agree to no more than a fairly modest increase in funding for border security measures—though perhaps as much as the $5.7bn Mr Trump had demanded for the wall—provided it is spent on anything but that. This appears to give Mr Trump and his supporters in Congress three choices, none of which looks appealing. The president could turn his nose up at whatever the Democrats offer and make good on his threat either to shut down the government again or invoke emergency powers to get the wall built. This would double down on his pre-existing tactic of governing exclusively for the dwindling minority of voters that constitute his base. Yet another shutdown would go as badly as the current one, only faster. On January 24th half a dozen Republican senators voted for a Democratic proposal to ignore the president’s demands and reopen the government. In the event of a second shutdown, that mutiny would grow—and Republican resistance, at a time when Mr Trump faces a welter of investigations, and perhaps impeachment, is the last thing he needs. Invoking his emergency powers would also be risky. His advisers have identified billions of dollars appropriated for military projects that Mr Trump could in theory redirect to wall-building. But Republican congressmen fear this could set a dangerous precedent for the next Democratic administration—it might, for example, declare climate change an emergency requiring even more drastic action. It would also risk getting snagged in the courts, and thereby enhance Mr Trump’s reputation for making a lot of noise while achieving little. Alternatively, Mr Trump might push for a bigger immigration reform. This would probably be along the lines of Mr Schumer’s offer of last year, only with more concessions by the president in recognition of the Democrats’ increased bargaining power. That could be popular. It might even presage the broader pivot to moderation and bipartisanship that a dogged handful of commentators still think Mr Trump might be capable of. But he would in this event be castigated by the immigration hawks who claim to speak for his base. They are already fuming over his cave-in on the shutdown. “Good news for George Herbert Walker Bush: As of today, he is no longer the biggest wimp ever to serve as President of the United States,” tweeted one hawk, Ann Coulter—disaffected author of “In Trump we trust: E pluribus awesome!”—shortly after the president’s Rose Garden address. Given that Mr Trump is thought to have launched the shutdown in response to criticism from Ms Coulter over his lack of wall-building, he will not want to aggravate her further. Indeed, for a possible clue to which way he is likely to go, Ms Coulter’s Twitter account will be worth watching. Mr Trump’s third option will be to accept whatever modest compromise the Democrats may be prepared to make, claim victory, and move on. Having no shame, he is capable of this. In Mr Trump’s telling, all of his bankruptcies and other failures were triumphs. Most of his supporters would probably stick by him, too. Even if he cannot build the wall, it may be enough for them that he says he wants to. Few other Republican leaders are pro-wall; and Mr Trump’s Democratic challenger next year certainly won’t be. The president may recover from this humiliation, then. But it has been significant. It has shown the power of Congress to check him—especially when House Democrats stay united as they have throughout the shutdown. By turn, it has also shown that, despite two years of defying the usual rules of governance, Mr Trump is as subject to them as any other president. He is unpopular, under investigation and now conclusively unable to deliver his signature campaign promise. His room for reckless misgovernance is shrinking.